Breathe in the fresh country air! Sit around the campfire and look at the stars! 4 Bedroom, 2 1/2 Bath Roomy Farmhouse. Fresh Air And Stars Included! Originally settled in 1903 by ancestors of the current owners, the farmhouse stands today in its original position overlooking a hops field operated by another descendant of the original settlers. With plenty of room to roam inside and out, the Hop Hill house has a main floor master bedroom with a queen sized bed and attached bath and 3 bright and spacious upstairs bedrooms equipped with double beds. There is an additional full bath upstairs and a half bath downstairs. The living room is large enough for the whole family to gather in comfortably and the dining room can seat up to 10 easily. The kitchen is fully equipped just like at home including a dishwasher for easy cleanup! If you are looking for a quiet place to sit and read or do a puzzle, check out the den. Help yourself to one of the many novels! There are 40 plus acres of woods and fields to hike or mountain bike or just relax under the shade of the maple trees and watch the hops grow. Grill out on the back deck and then enjoy a campfire under the stars! The stars will never seem brighter than what they are out in the countryside! If you are lucky, you might even see the Northern Lights! Leelanau County is a peninsula with nationally recognized areas of beauty. Within a half hour drive of the house you have the Sleeping Bear Dunes National Park which was named the most beautiful place in America by viewers of Good Morning America. You have the M-22 scenic drive voted best fall scenic drive by USA Today readers. Sign up for a trip on the charter boat Leelanautical out of historic Fishtown in the village of Leland and you can guarantee yourself a day of fun, fishing and sightseeing on Lake Michigan! Take the Manitou Transit ferry over to the Manitou Islands and hike the island. You have cherry orchards, apple orchards, vineyards and best of all, hops! Things to do include checking out the wineries, breweries and distilleries. Hit some of the various golf courses or go hiking, biking or boating! You are never more than a few minutes from a lake and beach. Comb the beaches of Leland or Good Harbor for Petoskey stones or Leland Blue stone. Leelanau County is known among foodies for its wonderful restaurants and Farmer’s markets. Settled by our ancestors over 100 years ago, the farmhouse is currently owned by Jeff and Cheryl Bredehoeft and managed by Jeff's sister and brother-in-law. Deb and Tony Radjenovich live next door to the farmhouse and manage it and help their son Ryan manage the hops farm. This qualifies it for a Centennial Farm designation! There are two full size bathrooms and one half bath. The master bath is attached to the master bedroom and has a walk in shower. The upstairs bath has a bathtub/shower combo. The half bath is on the main floor next to the main floor laundry. Originally settled in 1903 by ancestors of the current owners, the farmhouse stands today in it's original position overlooking a working hops farm. Large living room with plenty of room for large gatherings. Kitchen is fully equipped with pots, pans, dishware and silverware. Expandable dining room table can seat up to 10 easily. Large lawn and acres of woods to hike. Warm, welcoming home with many added features especially in the kitchen. Our group of six adults really enjoyed this home. We were very comfortable in the spacious living areas with nice furnishings. The owners provided books, games, DVDs, and puzzles. Small touches like hand soap, dish washing soap, laundry detergent, beach towels, and many other extras made it possible to just unpack our clothes and start our great adventure. We spent a week exploring the beautiful area of Traverse Bay and would highly recommend this home to anyone. We look forward to returning in the future. What a delightful home! Well situated and completely furnished. Three families shared this centennial farmhouse for a week with plenty of space as we celebrated our Smitten by the Mitten wedding! Memories for a lifetime.Thank you Deb and Tony. Thank you Mary Beth! So glad we could accommodate you and the whole gang! Beautiful home with ideal accommodations in a lovely setting! We stayed here with 3 adults and 5 kids and felt there was plenty of space for everyone. The setting and landscape are beautiful, and the hosts - Deb and Tony - were very nice and gracious, but also gave us our space even though their home is on the property about 100 yards apart from the rental house. Deb allowed our kids to pick fish raspberries daily from their garden and they were delicious. The house is about 5 minutes from town and 12 minutes from Suttons Bay. We would highly recommend this rental home and would love to stay here again! Thank you David! We really loved having you and your beautiful family. We truly love sharing the farm with others and really enjoyed watching your kids picking raspberries! Come again any time! Thank you so much! We would love to host you again any time! The property is well cared for and very relaxing. This is the perfect place to get away from the hustle & hustle. There is no noise or light pollution to ruin your tranquility. You are a short drive away from Fishtown, Northport, Suttons Bay, & the Sleeping Bear Dunes shoreline. There is fun to be found in the surrounding area for people of all ages. Our family of four (and sometimes seven, as others arrived) had the privilege of staying at this gem for the July 4th week. We were a short drive from Lake Michigan, Suttons Bay, Northport, Leland, Glen Arbor and Sleeping Bear. Close to lots of hiking, the Tart Trail for bicycling, wineries galore, and shopping. 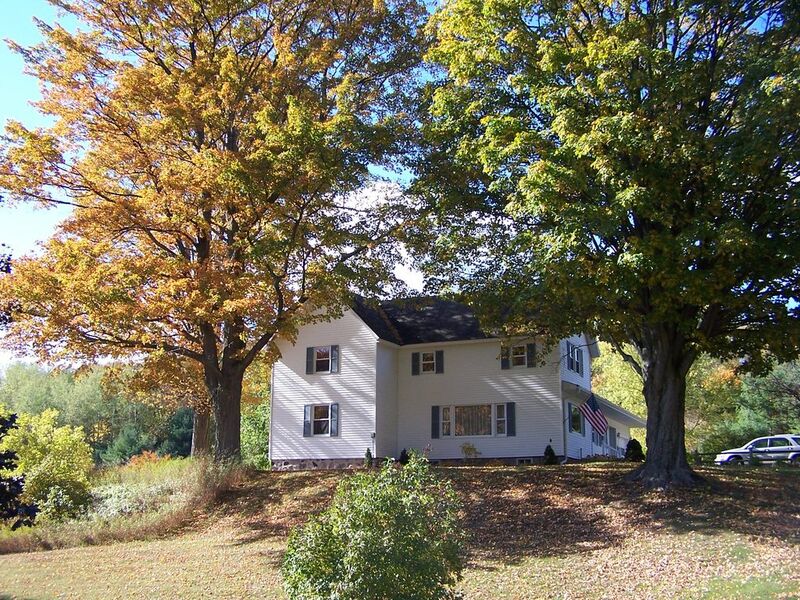 The farmhouse is obviously well cared for, updated, on a peaceful setting amongst mature trees and beautiful old barns. Very spacious, comfortable interior. The owners are close by and are very friendly, helpful and completely unobtrusive. We were very sad to leave this place; it felt like home. Highly recommended! We will definitely be back. Thank you! We love when our guests enjoy the farm as much as we do! Summer weekly rentals are from Sunday to Sunday.